A couple of weeks ago I was approached by a representative of the St. Louis Convention and Visitor’s Commission (CVC) about the possibility of my family traveling to St. Louis to, well, Explore St. Louis. So… What should we do? It’s been quite a while since I’ve been to St. Louis and my girls have never been. It will be a great adventure for all of us! 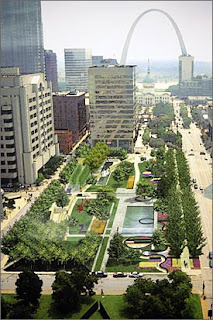 the new City Garden: while it may be filled with art I’m most attracted by the plants and the three fountains for the girls to splash in! It will also be walkable from our hotel. Plus it’s free. The Anheuser Busch brewery tour. Also free. Grant’s Farm. Costs for parking but admission is free. We only have 2 1/2 days- I know we can’t fit all that in. And there is so much more we would like to do! Now, let’s talk about food. One place we’re definitely going is the McGurks for dinner- and hopefully some music- they have it nightly!! Maybe lunch on a riverboat cruise? Possibly breakfast at Terrace View in City Garden? Charlie Gitto’s is supposed to be legendary. Tea at the London Tea Room (it’s the closest I’ll be getting to London for a few years). Doug would appreciate some BBQ, I’m sure. What’s not-to-be-missed eats in St. Louis? What would you like to see us do, eat or explore? Give me your suggestions and recommendations! To plan your our St. Louis adventure visit ExploreStLouis.com or the Explore St. Louis Facebook page. Full disclosure: While we are paying for our gas money to get to St. Louis and back all of the expenses we incur while there will be covered by the CVC. While the CVC is sponsoring our trip all the decisions and thoughts about where we go, what we do, see, eat, etc. will be my own. Please see my disclosure policy for more specific information. Ah, my old hometown. Great town. Ted Drewes Frozen Custard! Yummy and a classic. Imo's Pizza. A St. Louis Classic. Love the Magic House!!! The zoo rocks and it is FREE with a little train! The art museum and Forest Park are some of my favorite places. the science museum is said to be great – never did make it there. I actually never ever went up in the arch. It is very tight and high. But said to be a great view. Have fun! I agree Ted Drewes Frozen Custard is a must, and you must get Imo's pizza..but it tastes better with a Budwesier late at night! City Museum is supposed to be amazing (we haven't quite made it there). The science museum is also a lot of fun! If you get a chance to have Italian on the Hill, you have truly visited St. Louis!